Categories: Classes/Workshops, Community Events, Misc. Living with a chronic condition like diabetes, arthritis, high blood pressure, heart disease, pain, anxiety, or depression can be a daily challenge. But it doesn’t have to be. Healthy U, offered by the Wyoming Center on Aging, can help you take charge of your health—and feel better. 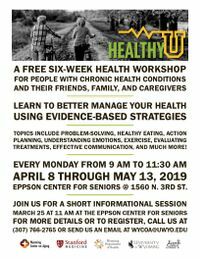 Healthy U is available to anyone with a chronic health condition, who cares for someone with a chronic health condition, or who simply wants to learn more about improving their health.